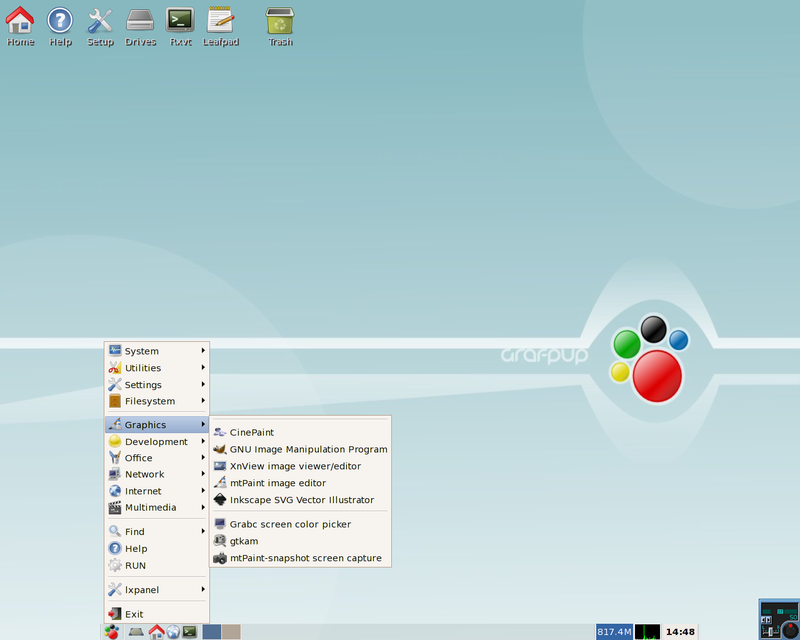 Grafpup Linux was a desktop Linux operating system based closely on Puppy Linux. Its goal was to be as useful to graphic designers and other imaging professionals as possible while still remaining extremely small and fast. Grafpup was a live CD of only 75MB with current versions of GIMP, Cinepaint, Inkscape, and Scribus. Grafpup was also very user-friendly, with wizards for doing most system tasks like connecting to the internet and installing to hard disk or USB drive. There was also a powerful package management system, "pupget", with a very extensive and ever increasing list of additional packages available for easy installation. Rate this project Pinguy OS is an Ubuntu-based distribution featuring the GNOME desktop environment. The project has published a new testing release, Pinguy 18.04 beta. The new development snapshot is based on Ubuntu 18.04 and features a smaller ISO (reduced by about 200 MB) and reduced memory footprint. Details and a screen shot can be found in the project's release announcement. "Pinguy OS 18.04 beta. Please read the release notes for the alpha. This is the beta, still a little bit buggy but getting closer to a final. Fixed the naming and logo in GNOME Control Center and other branding issues. Fixed the cursor theme so it works with Shell (dragging icons). Removed Docky and replaced it with Simple Dock & Places Status Indicator extensions. Audio levels can go past 100% by default. Made the Wayland session work with root apps. Reduced the size of the ISO. Reduced memory footprint. To turn the beta mini into beta full install these applications: sudo apt-get install variety steam playonlinux pinta shotwell rapid-photo-downloader deluge...." Interested beta testers can download the Pinguy OS 18.04 beta live DVD image from SourceForge: Pinguy_OS_18.04_Beta_x86-64.iso (1,675MB, SHA256, pkglist). Pinguy OS is an Ubuntu-based distribution which offers a customized GNOME desktop environment intended to be easy to use for new Linux users. The project's latest release, Pinguy OS is based on Ubuntu 18.04 LTS, and includes GNOME 3.28. Support for 32-bit computer has been dropped from this release. The project's release announcement lists several new changes: "Tweaked Gnome 3.28.2. OpenGL version string: 3.1. Mesa 18.1.1. File Manager: Nemo 3.8.3. Kernel 4.15.0-20. Downgraded the DRI driver for Xorg to DRI2, this fixes RetroArch. Included Winepak's repo so it will be easy to install Window games. Enabled exFAT support. Removed Docky and replaced it with Simple Dock & Places Status Indicator. Audio levels can go past 100% by default. Fixed Shutter but will only works under Xorg. Some of the default Gnome apps have been replaced with MATE versions. I really did not like the new Gedit so replaced it with Pluma. If you use the Gedit command it will open Pluma. That is so all the guides on the forum and other sites that use Gedit in their guides will work fine." Pinguy OS is available in Full and Mini editions. Download (pkglist): Pinguy_OS_18.04_Full-LTS_x86-64.iso (2,932MB, SHA256, torrent), Pinguy_OS_18.04_Mini-UEFI-LTS_x86-64.iso (1,616, SHA256, torrent). Pinguy OS is an Ubuntu-based distribution featuring the GNOME desktop environment. The project has published a new testing release, Pinguy 18.04 alpha. The new development snapshot is based on Ubuntu 18.04 and features some changes to the default list of applications. Details and screen shots can be found in the project's release announcement. "This is a very early alpha. There are going to be bugs. This is basically the Mini. All it really has installed is Firefox, VLC and Deluge. Docky is very unstable. It crashes often but its run from a script that will restart it if it crashes. Peerflix is installed and working. Some of the default GNOME apps have been replaced with MATE versions. I really did not like the new Gedit so replaced it with Pluma. If you use the Gedit command it will open Pluma. That is so all the guides on the forum and other sites that use Gedit in their guides will work fine. Have a play with it and let me know what you think. It's still in the early stages, but the foundations to build the full version are almost there." Download the live DVD image from SourceForge: Pinguy_OS_18.04_Alpha1.1_x86-64.iso (1,850MB, SHA256, pkglist). 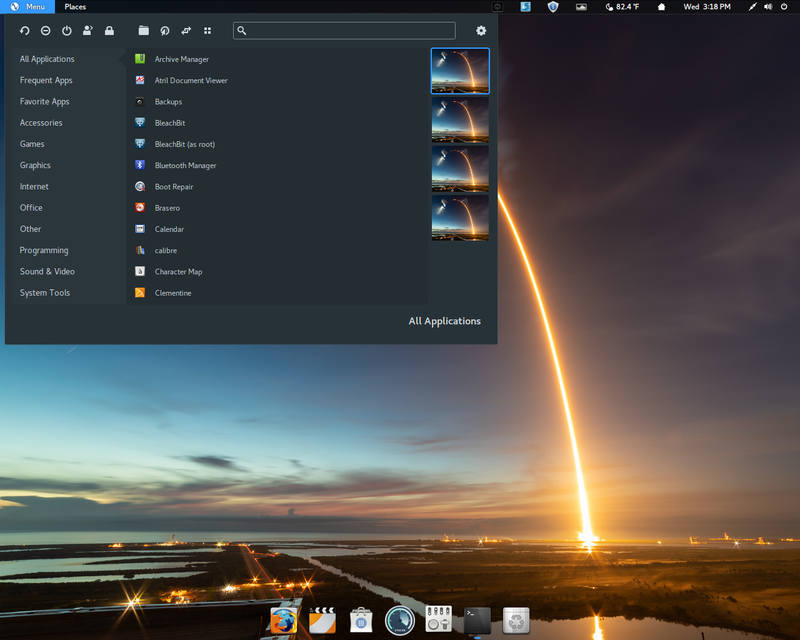 The developers of Pinguy OS, a desktop distribution based on Ubuntu, have announced the release of a minor update to the distribution 14.04 series. The new release, version 14.04.3, offers users a number of enhancements, including support for booting on EFI-enabled computers. This release also includes Firefox 40 and Pepper Flash has replaced Adobe Flash. "This is just a real quick update. All images of Pinguy OS 14.04.3 have now got EFI Support. Apart from that very little changes. All packages are up-to-date as of September 11 2015. Some Info: Nemo updated to 2.6.7, running kernel 3.13.0-64, Firefox 40.0.3, using Pepper Flash in Firefox instead of Adobe Flash, added the H.265/HEVC Codec for VLC, desktop wallpaper changer disabled by default (open Variety to enable)." The release announcement goes on to mention that the Firefox web browser will download the Silverlight plugin the first time it is launched. Download: Pinguy_OS_14.04.3-LTS-EFI_x86-64.iso (2,949MB, MD5, torrent, pkglist). Antoni Norman has announced the release of Pinguy OS 14.04.2, a point update of the project's Ubuntu-based Linux distribution with a customised GNOME Shell desktop: "I am happy to announce the availability of 14.04.2 point release. Apart from bug fixes and updating packages not a lot has changed from 14.04 Papercuts. So if you are running 14.04 Papercuts and have kept it updated there is no need to install the point release. Pinguy OS 14.04.2 is running Linux kernel 3.13 and the UEFI version of GRUB. If you had issues installing Pinguy OS on a UEFI-enabled system in the past, this should now be fixed. List of some of the pre-installed applications: Mozilla Firefox 36.0.4, Mozilla Thunderbird 31.5.0, Synaptic package manager 0.81.1, VLC media player 2.2.0 RC2, GNOME Tweak Tool 3.10.4, LibreOffice 4.2.7, Clementine 1.2.3, Shutter 0.93.1, PlayOnLinux 4.2.2, WINE 1.7.38." Here is the brief release announcement. The "Full" and "Mini" Pinguy OS 14.04.2 live DVD images are available for download SourceForge: Pinguy_OS_14.04.2-LTS-x86-64.iso (2,657MB, MD5, torrent), Pinguy_OS_14.04.2-LTS-Mini-x86-64.iso (1,947MB, MD5, torrent). Antoni Norman has announced the release of Pinguy OS 14.04, an Ubuntu-based desktop Linux distribution with a customised GNOME Shell desktop. This arrives after several "false" releases; yet the release announcement largely concentrates on further bugs and known issues: "The full final has been released. Known bugs: selecting auto login in the installer does not work - I had to disable it so the live session would auto login; Apturl is broken, this is an issue with Ubuntu; to make the distro work with GNOME 3.12 I had to add restore extensions to start-ups - this forces the extensions to start; if you use symbols in your password make sure you pick the correct keyboard; in Firefox some of the add-ons are disabled, just run add-on update to enable them." The "Full" and "Mini" Pinguy OS 14.04 live DVD images are available for download from the project's page on SourceForge: Pinguy_OS_14.04-LTS-x86-64.iso (2,270MB, MD5), Pinguy_OS_14.04-LTS-Mini-Final-x86-64.iso (1,561MB, MD5). Antoni Norman has announced the second and final beta release of Pinguy OS 13.10, an Ubuntu-based distribution with a tweaked GNOME 3.10 desktop: "Pinguy OS 13.10 (based on Ubuntu 13.10) has been released with GNOME 3.10 by default, along with some new tweaks. This is the final 13.10 release but it's called beta because only LTS releases are considered stable. The latest Pinguy OS 13.10 ships with the GNOME 3.10 desktop with GNOME Shell as the default 'shell', customized with various extensions. Since GNOME 3.10 is used, it means you'll get all the goodies available in the latest stable GNOME, which aren't available in Ubuntu 13.10 by default - client side decorations for applications such as GNOME Tweak Tool, GNOME Documents and so on, the new GNOME Shell System Menu, pagination in the GNOME Shell app picker, all the System Settings improvements included in GNOME 3.10 and more." Here is the full release announcement with a screenshot and a video. Download: Pinguy_OS_13.10-beta2-x86-64.iso (2,477MB, MD5, torrent). Antoni Norman has announced the beta release of Pinguy OS 13.04, an Ubuntu-based distribution featuring the GNOME 3.8 desktop. Although it comes with a beta label, this is the final release in the 13.04 series as the developers keep the "stable" tag strictly for LTS (long-term support) releases. From the release announcement (as published by Web Upd8): "Pinguy OS 13.04 (based on Ubuntu 13.04) beta has been released, this being basically the final 13.04 version because Pinguy has decided to keep the 6-month releases as betas and only the LTS will be considered stable. The non-LTS releases will be using bleeding edge software, like XBMC 13.0 alpha or GNOME 3.8 / GNOME Shell 3.8 that's included in Pinguy OS 13.04, but which isn't included by default in Ubuntu 13.04 and so, it isn't considered fully stable in Ubuntu. According to a recent Pinguy OS blog post, the 6-month releases are usable, but they might not include features that will be available in the LTS." Download: Pinguy_OS_13.04-Beta_x86-64.iso (2,438MB, MD5). Antoni Norman has released an initial alpha build of Pinguy OS 13.04, an Ubuntu-based distribution with a customised GNOME 3.8 desktop: "Pinguy OS is still being activity worked on. There has been a release for 12.10 and a 13.04 release is being worked on at the moment. If you want to keep up to date with the development of Pinguy OS it's best to follow the Information thread on the forum. This blog will be mainly for news on the LTS releases. I have decided to keep the 6-month releases as betas/snapshots of what the LTS will become. The 6-month releases will be using bleeding edge software that hasn't been fully tested. For an example the 13.04 release is using Gnome Shell 3.8.1 (something that isn't included in Ubuntu 13.04 by default). The 6-month Pinguy OS releases will be missing features that will be in the final LTS, but the release will be very usable." See this brief blog post for more information. Download: Pinguy_OS_13.04-Alpha_i686.iso (2,312MB, MD5).